“We have managed to make land-to-sea ballistic, not cruise, missiles that can hit any vessel or ship from 700 km [435 miles],” Iran’s state-controlled Fars News Agency quoted Amirali Hajizadeh, the head of the IRGC’s airspace division, as saying on Tuesday, according to Reuters. The high-ranking IRGC official noted that the Shiite Islamic Republic’s Supreme Leader Ayatollah Ali Khamenei urged Tehran a decade ago to develop the capability of “hitting ships” with ballistic projectiles. Hajizadeh “did not give details on the previous range of the missiles. In 2008, Iran displayed a ground-to-sea missile that it said could travel about 290 km (180 miles),” Reuters pointed out. 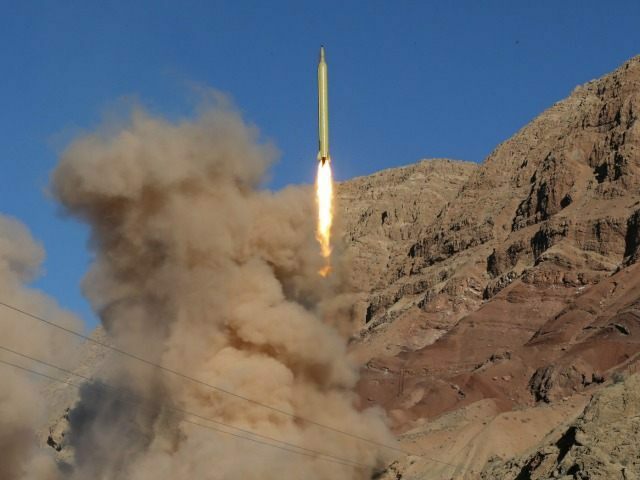 The IRGC’s revelation that it has more than doubled the 2008 range of Iran’s land-to-sea ballistic missiles comes a few months after U.S. President Donald Trump pulled out of the controversial Iranian nuclear program in May, arguing that the deal failed to meet expectations. Under the deal, Iran was supposed to curb its nuclear program in exchange for sanctions relief. President Trump also said the deal was flawed because it did not curtail Tehran’s ballistic missiles program or its support for terrorist proxies in Syria, Yemen, Lebanon, and Iran. The Trump administration has reimposed sanctions that are expected to cripple the economy of Iran, deemed the world’s leading sponsor of terrorism by the U.S. government. Iran has long claimed its missile program is only defensive and has threatened to disrupt oil shipments through the Strait of Hormuz in the Gulf if the Trump administration tries to strangle Tehran’s oil exports further. Tehran has dismissed negotiations with Washington over Iran’s military capabilities. It also denies that its activities are brewing instability in the Middle East. “Iran has the largest ballistic missile force in the Middle East, with more than 10 ballistic missile systems in its inventory or in development,” he told reporters on September 20.